The mystery of the atom has keep researchers trying to unravel its secrets for more than 100 years. Reviewing atomic data from the past and reorganizing / renaming the basic structural patterns to prevent confusion with future readers, a more logical periodic table of elements can be created. Using the same basic patterns inherit in the atom’s electron organization and then applying them to the internal protons and neutrons in the atomic nucleus, a second chart can then be introduced. The first periodic table of elements was introduced in 1869 by Mendeleev. This table organized the elements by chemical properties and today is still used by all science classes from elementary school through colleges with graduate degrees. Differences in charts can be seen by the various technical publishers but the main organization still remains the same. Quantum theory was introduced in the early 1900’s which should have revolutionized the periodic table but somehow was missed by the scientific community to create a new chart. This scary word “quantum” must be redefined into a more meaningful and easy to understand term. The atom is comprised of three basic particles, the electron, proton, and neutron. The protons and neutrons are located in the nucleus of the atom while the electrons are in orbits around this nucleus. The easiest way to understand the atomic structure is to pretend the electron lives at an address and at that address the house can have 1 or more bedrooms with bunk beds. Knowing where the electron sleeps is basic quantum theory. The electrons in orbit around an atom are located in regions called “Shells” or in simple terms “Which House?” Shells are defined by the numbers 1, 2, 3, 4, 5, etc. (Note: confusion arises when some text books called these shells by the letters K, L, M… instead of 1, 2, 3…). Subshell G – 26 electrons max with the pattern continuing. (Note: Confusion again arises when text books label the subshells as S, P, D, F, G, H, ….). In quantum theory the quantum number for each subshell A, B, C, D, E, F, G…. is represented by the subshell quantum numbers 0, 1, 2, 3, 4, 5, 6 etc. We have now defined all possible locations of the electron. In terms of quantum theory the electron will have its location/spin defined by 4 quantum numbers; Shell, subshell, orbital, and spin; or in simple terms; house, bedroom, bunk bed, top or bottom bed. 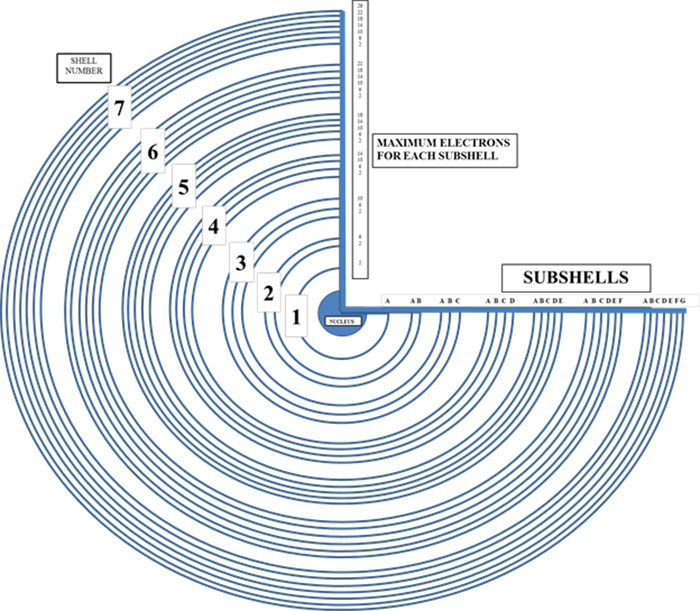 Figure 1 shows the basic pattern of the shells and subshells of any atom. Let’s now stack this number sequence keeping all 2’s below each other. If one replaces the numbers back to the original shell/subshell notations then you get the pattern shown in figure 2. The pattern continues to infinity. So if you start from the top and work from left to right you will be going up in the energy sequence for the subshells. 8A would have the highest energy of the subshells shown and would win the tug-of-war competition if going against any bedroom (subshell) listed before him. 1A would always lose since it has the lowest energy. So now let’s say a school bus full of electrons is on its way to a field trip to “camp quantum”. The cabins at camp will be our houses. When the bus arrives the electrons leave the bus and must go to the proper bedroom in the correct cabin. The first two electrons will go to cabin 1, bedroom A. The next two electrons will go to cabin 2, bedroom A. The next six electrons will go to cabin 2, bedroom B. Now we must define how the electrons pick their bed. Let’s use cabin 3, bedroom C as our example. We know bedroom C has 5 bunk beds called -2, -1, 0, +1, and +2. All electrons love the top bunk which is filled first starting from -2, to -1, then 0, +1, and finally +2. Then the sixth, seven, eighth, ninth, and tenth electrons will fill the bottom bunks starting again with -2, -1, 0, +1, and +2. This filling trick is called “Hund’s rule” named after the discoverer of this sequence. All bunk beds in all bedrooms are filled in this order starting with the top bunk of the lowest number bunk bed and ending with the bottom bunk of the highest number bunk bed. You now have all the information you need to put any electron in the proper location. If we take the subshell filling order shown in figure 2 and draw each subshell as a set of blocks then we will have the pattern shown in figure 3. These blocks now represent the beds that the electrons can sleep in. The names of the orbital pairs or “bunk beds” are shown under the blocks at the bottom of the chart. The element symbols can also be added to the blocks to complete the chart. Element numbers are defined by the number of protons in the nucleus and will have the same number of electrons. (Note: atoms can gain or loss electrons making the element an ion. This condition will be addressed later in this paper. 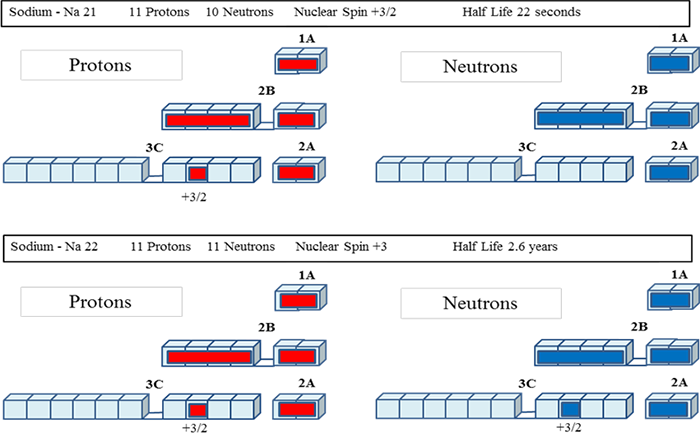 The number of neutrons can vary and will also be discussed later in the paper). Hydrogen (H) has 1 proton and 1 electron and can be called atom #1. Helium (He) has 2 protons and 2 electrons and can be called atom #2. Lithium (Li) has 3 protons and 3 electrons and can be called atom #3. The list continues with each element containing equal numbers of protons and electrons. Now let’s do an example. What are the 4 quantum numbers for hydrogen? Or in simple terms where is the electron located (shell, subshell, and orbital pair) and what is its spin? Or in very simple terms; which house, bedroom, bunk bed, and top or bottom bed is the electron sleeping in? As we can see from the chart in figure 4 the first block containing the symbol H for hydrogen is where the electron is located. We see a “1A” meaning the electron is in house 1 or shell 1 (1 is the first quantum number) and bedroom A or subshell A (0 is the second quantum number since all A’s have the quantum number 0). Next if we go to the bottom of the chart directly below the column of A’s we see the bunk bed number 0 or orbital number 0 (0 is the third quantum number). And since hydrogen only has 1 electron that electron must be on the top bunk which means the electron spins counter-clockwise (-1/2 is the forth quantum number for all electrons on the top bunk). So the 4 quantum numbers for hydrogen are: 1, 0, 0, -1/2. When looking at Figure 4 pretend all blocks have no element symbols except block #7 which shows N for the symbol for Nitrogen. We can see the first 2 electrons for Nitrogen are located in subshell 1A. The next 2 electrons for Nitrogen are located in subshell 2A. Subshell 2B can hold a maximum of 6 electrons however since Nitrogen is located in the third block of 2B that means Nitrogen only has 3 electrons in subshell 2B. Or in simple terms we have some empty beds in House 2, bedroom B. Since we know that electrons fill the top beds first (Hund’s rule) then we can see the fifth, sixth, and seventh electrons fill the top beds of bunk beds (orbital pairs) -1, 0, and +1 respectively. Since the seventh electron is located in bunk bed +1 and is on the top bed then you have all the information for the four quantum numbers: Shell (house) 2, subshell (bedroom) B (remember all B’s have the quantum number 1), orbital pair (bunk bed) +1, and spin (top bed) of -1/2. So the 4 quantum numbers for Nitrogen are 2, 1, +1, -1/2. Do all elements follow this pattern precisely? No. The electronic configuration (electron location) for each element is known. When you check the pattern shown in figure 4 against all electronic configurations you will see that 17 atoms are off slightly. If you study these 17 elements you can see that they can be organized in 3 groups. If you carefully look at the blocks in figure 4 you will see tiny arrows above some of the symbols. Let’s do an example of group 1. What are the 4 quantum numbers for Chromium (Cr) atom #24? Chromium is the first element that is slightly off. Note the forward arrow “>” just above the block for Chromium. The arrow indicates that you must add 1 electron in subshell 3C and subtract 1 electron from the subshell before it, subshell 4A. Chromium is suppose to have 4 electrons in subshell 3C but has 5 since it swiped one from 4A. Since Chromium has 5 electrons in subshell 3C we can see from the orbital pair numbers along the bottom of the chart that the 5 electrons are located in the top beds of the bunk beds with the fifth electron located in orbital pair +2. So the 4 quantum numbers for Chromium is shell 3, subshell C (all C subshells have the quantum number 2), +2 orbital (bunk bed), and -1/2 spin (top bed). The answer for Chromium is: 3, 2, +2, -1/2. Let’s do another example for group 2. What are the 4 quantum numbers for Uranium (U) atom #92? Find block 92 in figure 4. Note the backwards arrow “<” just above the U. The arrow indicates that you must subtract an electron from subshell 5D and add 1 electron to the next subshell which is 6C. That electron thrown up into subshell 6C is the electron that defines the 4 quantum numbers for Uranium. That electron is all alone in 6C and must be in the -2 orbital pair (bunk bed) and located on the top bed (-1/2 spin). So the location for this electron is Shell (house) 6, subshell (bedroom) C, orbital pair (bunk bed) -2, and spin (top bed) -1/2. So the 4 quantum numbers for Uranium are 6, 2 (for all C’s), -2, -1/2. Let’s do an example of group 3. What are the 4 quantum numbers for Palladium (Pd) atom #46? Find block 46 in figure 4. Note the double forward arrows “>>”. This double arrow indicates you must add 2 electrons in this subshell (4C) and subtract 2 from the previously filled subshell (5A). Palladium is the only element that has this unusual property and stands alone in this third category. Since Pd is located in the eight block of subshell 4C it should have 8 electrons but actually has 10 which fill this subshell. The first 5 electrons take the top beds while the last 5 electrons are in the bottom bed. So that last or tenth electron is located in orbital pair +2 (bunk bed) and is located on the bottom bed (spin +1/2). So the 4 quantum numbers for Palladium are 4, 2 (for all C’s), +2, +1/2. We have now covered all possibilities to determine the location of any electron for any element including the 3 groups of 17 exceptions to the rule. Since the elements Lanthanum and Actinium are part of Group 2, confusion arises for various technical publishers of the Periodic Table of Elements not knowing where to put these elements. Not all Periodic Table of Elements are the same. Another interesting observation when looking at figure 4 is that elements above and below each other have similar chemical properties. This is similar to the original Periodic Table of Elements. Look at atom #3, Lithium. This element has 1 electron in its outer shell. Lithium is called an alkali metal. All elements directly below Lithium have 1 electron in their outer shell and are all called alkali metals. Beryllium, atom #4 has 2 electrons in the outer shell and is called an alkaline earth metal. Elements below Beryllium are also alkaline earth metals and have 2 electrons in the outer shell. Atoms always want to have either 0 or 8 electrons in the outer shell. An element like Neon, atom #10, has 8 electrons in the outer shell. All elements below Neon also have 8 electrons in the outer shell. These elements are called inert gases and do not want to combine or react with any other atom. An element like Fluorine, atom #9, has 7 electrons in the outer shell. All elements below Fluorine also have 7 electrons in the outer shell and are all called halogens. Elements with 7 electrons in the outer shell want to combine with elements with 1 electron in the outer shell to get to the 8 number. Elements with 6 electrons in the outer shell will combine with elements with 2 electrons in the outer shell to also get to 8. Hydrogen and Helium are exceptions to the rule. Hydrogen does have 1 electron in the outer shell but is not called an alkali metal even though is does have metal properties at super cooled temperatures. Helium has 2 electrons in the outer shell but is not an alkaline earth metal but instead behaves like an inert gas. Let’s move on to the nucleus. The nucleus of the atom contains the heavy stuff; protons and neutrons. Each proton or neutron weighs approximately 2000 times the weight of an electron. Science shows on TV always seem to show the atom as a clump of protons and neutrons for the nucleus with the electrons in orbit around it. This is NOT the case. Protons and neutrons (called nucleons) are in orbits just like the electrons. They are located in shells, subshells, orbitals, and have spin. However protons and neutrons have additional subdivisions with each particle define by a set of 9 quantum numbers. To decipher the complex data typically seen in nuclear physics books one must start with the subshell labeling. Since we have already re-defined the subshells for the electrons we will use the same idea. 1A 2B 3C 2A 4D 3B 5E 4C 3A 6F 5D 4B 7G 6E 5C 4A and so on. There does not seem to be a pattern to the filling yet. Let’s now replace each subshell with the maximum number of nucleons. 2 6 10 2 14 6 18 10 2 22 14 6 and so on. Still no pattern has emerged yet. Subshell F 12 and 10 and so on. Now let’s stack this sequence keeping all 2’s below each other. The next thing we need to do is to replace the numbers with blocks but still keep the conjugate pairs together. We can now label the blocks by the appropriate subshell location. The block pattern is shown in figure 4. Now let’s put the element symbols/numbers in each block and along the bottom of the chart insert all the numbers that represent the complex pattern of quantum numbers for each shell, subshell, orbital pair, conjugate pair, and individual location. At the left we will show additional data showing the remaining quantum numbers. See figure 5 for the completed Inner Atom Table. So just like the Outer Atom Table, when you start at the top and go across from left to right you will be going up in energy for the subshells in the nucleus. These numbers are shown on a chart called the “Chart of the Nuclides” which is used by nuclear physicists around the world. This chart also shows individual blocks for the few thousand isotopes that are naturally occurring and man-made. The columns or rows that represent magic numbers are in bold outline to note the stability. The chart can be found on the internet. Since the magic numbers fall on certain locations at the end of one of the conjugate pairs then you can now generate a computer program to list all the magic numbers to a million if desired. The next magic number would be 184 if the Inner Atom Table is extended down another level. But where are the protons really located? Where are the neutrons located? Are they sharing the same subshells? What data can we used to answer these questions? Physicists are able to measure the net nuclear spin of the nucleus of an atom whether it is naturally occurring or man-made; with a half life or without. These nuclear spin numbers vary but take on numbers that can be fractional (x/2) or whole numbers, plus or minus spins. The problem is many of the nuclear spin numbers are 0 indicating no net spin. If we flash back to the electrons we remember they fill the top bunk beds in a bedroom first before filling the bottom beds (Hund’s rule). Protons and neutrons DO NOT do this. Protons and neutrons fill both beds of a bunk bed first before moving to another bunk bed. And the order of which bunk bed (orbital pair) and final subshell filling is not obvious. The patterns of this special filling can only be seen after studying the net nuclear spin of each isotope (atoms with same number of protons but differing number of neutrons) and mapping to the individual spin locations using the Inner Atom Table. Some isotopes with the same mass even have 2 possibilities of nuclear spin and a few 3 (extremely rare). An even number of protons will produce a 0 spin since there will be no bunk beds with a single proton. An even number of neutrons will produce a 0 spin also. If an isotope of an element has an even number of protons but an odd number of neutrons then the net nuclear spin is because of the location of that last odd numbered neutron sitting in some bunk bed alone. The same would occur if an isotope has an odd number of protons and even number of neutrons. If the isotope has both an odd number of protons and an odd number of neutrons then both of these nucleon’s spin will be added together to acquire net nuclear spin of the nucleus. Two electrons are not allowed to share the same bed. This is called the “Pauli Exclusion Principle” named after the discoverer. This also applies to the nucleus so when you see the patterns of the filling you can theorized that the protons and neutrons are in their own set of subshells since nucleons cannot share a bed. That means you must now duplicate everything! The easiest way to understand this is to now have all cabins with a second story where all the neutrons live on the second story. So for example cabin 3 would have 3 bedrooms on the first level for the protons and 3 bedrooms on the second story for the neutrons with each bedroom containing bunk beds as before. Rule 1: No conjugate set can be incompletely filled except for a single nucleon only. All or 1 in simple terms. When filling conjugate sets, find the atomic symbol of the element. Remove the last odd proton (only if an odd number exists) and count the remaining protons in that last filled conjugate set. Rule 2: Take the even number of protons calculated in Rule 1 and move ahead to the next conjugate set that matches the number of protons. Install protons in that conjugate set. (In some cases you must move ahead several conjugate sets to match the even number of protons). Rule 3: Perform Rules 1 and 2 twice; 1 time for neutrons and again for protons. Rule 4: If an odd number was encountered in Rule 1 then the single extracted proton will be installed in one of the empty conjugate pairs remaining located before (backup more than 1 set if needed) or after (move ahead more than 1 set if needed) the last filled conjugate pair. This single nucleon will also take the position of the highest spin number (+ or -) within that conjugate set. You have 3 possibilities for nuclear spin: odd proton, odd neutron, odd proton and neutron. When these rules are followed and the nuclear spin is known, the position of the neutrons and protons become clear. A few examples of Sodium (Na) isotopes are shown below. The shaded red areas show locations of protons while the shaded blue regions show locations of neutrons. Protons have a charge of +1 while electrons have a charge of -1. Neutrons are neutral with no charge. Two protons in orbit near each other want to push apart. This is similar to trying to bring the north poles of 2 very strong magnets together. This problem in the nucleus of trying to keep the protons from flying apart is one of the mysteries of the atom and physicists call this force that keeps the protons together the nuclear strong force. We now have the Inner Atom Table to help resolve this issue. The next thing to do is to breakdown the charge. If you add up the 3 fractional charges you get a +1 charge. If you add up the 3 fractional charges you get a 0 charge for a neutron. Notice that 2 of the 3 quarks are the same for the proton and neutron. If you theorized that a proton could throw one of its +2/3 quarks at a neutron while at the same time the neutron throws one of its -1/3 quarks at the proton then you have actually turned the proton into a neutron and also turned the neutron into a proton. The 3 quarks for a proton or neutron only account for approximately 30% of the weight of the individual nucleon. So there is other neutral material making up 70% of the weight of a proton or neutron. A single quark only accounts for 10%. Now that we have an understanding of the nuclear complexity of the subshells lets take the theory to another level. What if an orbiting proton gets too close to another orbiting proton but just before the strong charge force pushes against each other a nearby orbiting neutron tosses the -1/3 quark to one of the protons and the protons tosses the +2/3 quark back then you save the day! The nucleus stays stable. But what if there is not a neutron nearby? The atom falls apart and radioactivity occurs in one of several different ways. When the atoms get bigger, more protons are in orbit so the complexity of the quark swapping requires extra neutrons in orbit to keep stability. This is why as you go up in atomic numbers more neutrons are needed or in other words the neutron/proton ratio must increase. The quantity of neutrons will be much more than the quantity of protons in heavy atoms as can be seen in the stable isotope of lead (Pb) 208 which has 82 protons and 126 neutrons. Also note that this isotope of lead has magic numbers for both protons and neutrons making this a double-magic isotope. So if we go back to the cabins with their theoretical 2 story construction we can see that if quark swapping occurs then you will have some protons on the second story and some neutrons on the first floor for any fraction of a second to keep stability in the nucleus of the atom. This also makes sense when physicists split the atom with a high energy particle. The two pieces are always very near to the neutron/proton ratio of the original atom. Think of it as a tornado coming through camp and blowing off the second stories on all the cabins which land in a nearby field. Let’s use lead 208 as our example. The second stories of all the cabins have enough bunk beds to hold the 126 neutrons while the first story has enough bunk beds to hold 82 protons. But wait! We theorize the quark swapping causes a mix of protons and neutrons on the second story and also on the first story. So when the tornado hits, the second story pieces that landed in the nearby field contains both protons and neutrons creating a smaller atom that will have approximately 126 nucleons (mix of protons and neutrons). The first floor also has a mix of protons and neutrons that add up to 82. So what you get is two pieces that is a mix of protons and neutrons that was originally the quantity of protons for one piece and the quantity of neutrons for the second piece. The pieces may vary by a few nucleons but scientific data show the ratio is always close to the original proton / neutron numbers. Are the protons and neutrons really throwing quarks back and forth or is there another particle involved? Is there scientific data to backup this theory? The particle called a pion is known to be responsible for charge movement. This particle contains just 2 quarks is most likely responsible for this juggling act. This pion particle is made up of slightly different quarks than the protons and neutrons. Physicists have discovered the existence of 6 quarks. The pion is just another example how complex an atom really is. Many other nucleus pieces have been discovered by physicists but will not be discussed in this paper. Are there any other patterns recognizable? Let’s compare the subshell filling order for the electrons and nucleons which we know are different. If you look at the atom diagram in figure 1 and put a mark next to each subshell as you fill them in order, you will notice the subshells always balance the marks within each shell with the pattern shown in figure 6. When electrons fill this pattern and enter a shell for the first time they always enter subshell A first. When nucleons fill this pattern and enter a shell for the first time they always enter the last subshell first. So for shell 4 which has subshells A, B, C, and D, the D subshell would fill up first. This also keeps the symmetrical pattern shown in figure 6 when comparing with the electron filling. The fact that you can generate two technical charts, The Outer Atom Table and the Inner Atom Table which both are created using this subshell filling pattern is amazing! This complexity of motion does not occur by accident. Does an atom have a limit in size? What is the largest atom? What about these new elements physicists keep discovering? What really needs to be defined is what would be logical rules to define an atom. The most common sense solution is an atom that has an equal number of protons and electrons to give the atom the neutral charge. Makes sense right? Well in order to determine how big we have made an atom we must look at more data. The electron data called valance is a perfect start. When an element has a +2 valance, it means it must have lost 2 electrons; for example Calcium with 20 protons losing 2 electrons. The net charge of the Calcium atom would be +20 (protons) added to the -18 (electrons) giving a value (charge) of +2. When you look for valance data for the heavy elements you noticed it stops at element 105 which has a +5 valance number. Another very interesting fact is element 104 has a +4 valance, element 103 a +3 valance, element 102 a +2 valance, and element 101 with a +1 valance. This is strange because of the subshell location of these elements should not have valances with these numbers. So what if there is a set limit to the number of electrons that can be put in orbit and let’s theorize the number is 100 and no more. Does this make sense? Let’s test this theory. If this theory is correct then element 105 never really lost 5 electrons it NEVER had them. Valance measurements of Element 105 would show up as a +5 since the charge of the 105 protons detected would be combined with the charge of the 100 electrons in orbit. So what that means is Element 104 never lost 4 electrons it never had them. Same with elements 103, 102, and 101 they never had them. This means that the last or biggest atom that can be made with an equal number of protons and neutrons must be element 100. So physicists are really generating super heavy nucleus’s which are radioactive and half life away at the blink of any eye. This brute force method of nucleus creation will probably continue for years since current data is approaching 120. The pieces of the atomic puzzle are coming together. Who knows what other mechanisms and particles will be discovered to account for some of the subtle anomalies encountered when unraveling the secrets of the atom. The future is holding many more mysteries for us to discover! It should be clear that the complexity of the atom presented here could not have occurred by accident or chance and that there must be an intelligent creator behind the scenes responsible for this unbelievable interaction of particle physics. GOD has given us many complex puzzles for us to solve so we may better understand him on a scientific level as well as on a personnel level. As time goes on, physicists will continue to decipher many more secrets of the atom until the smallest of all particles, the GOD particle is finally discovered and understood.